Many of the advertisers switching to Real Attribution were working or considering working with an “Assisted Model” in which assisted touchpoints are rewarded. In practice, there are big differences in the flexibility, performance, and ROI of both models. 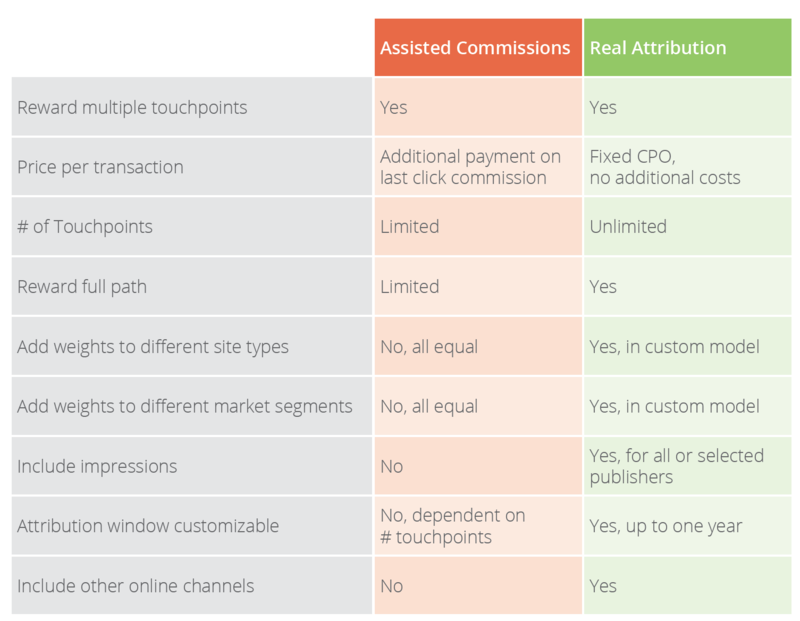 In this document we elaborate on the difference between “Assisted Commission” setups and “Real Attribution”. When using Assisted Commission models, advertisers pay an additional commission for assisting touchpoints involved in a transaction. If a transaction comprises of 3 assisting touchpoints, the advertisers reward these touchpoints with a “bonus”. Real Attribution allows for a different setup, as the attribution model determines the share for each touchpoint involved in the transaction and rewards them accordingly. Being transparent about the amount you will be paying for a transaction is something that benefits all parties working in e-commerce. As an advertiser working with Real Attribution, you determine your optimal Cost per Order, which is then shared over all touchpoints involved, nsuring that the amount being paid out is known upfront. If rewarding other touchpoints on an Assisted Commission model, your total CPO will not be clear as you will need to provide additional payments when assists are involved. In order to maximise their gain from this model, publishers can easily start to sending a greater amount of low quality traffic, which ends up in advertisers paying an higher fee, and resulting in lower ROIs. When analysing Attribution paths, we see that different site types often cluster together at various point in the path. For example, in the case of a customer booking his holiday, we see content sites and bloggers in the initial stages of conversion paths. Price comparison and deal sites are used to gather information at the next stage, and at the later stages consumers tend to visit voucher and cashback sites to find the best deal around. By using an assisted model, advertisers aren’t able to reward publishers which add value through the whole journey as the model is only rewarding the publishers from the same site type which cluster around the end of the conversion path. This means that advertisers end up paying additional payments to publishers from the same site type as the converting publisher. With Real Attribution, the total Cost per Order is clear upfront, so all publishers from the same site type get rewarded in a similar way if they are in similar roles, meaning you don’t have to pay more as an advertiser. Not only that, but you also ensure that publishers which add the value you want them to add are rewarded properly. Using Real Attribution, advertisers can reward different site types or market segments in their attribution model, based on their own preferences. By giving weight to specific site types or market segments, advertisers can add value where they’d like to add value. 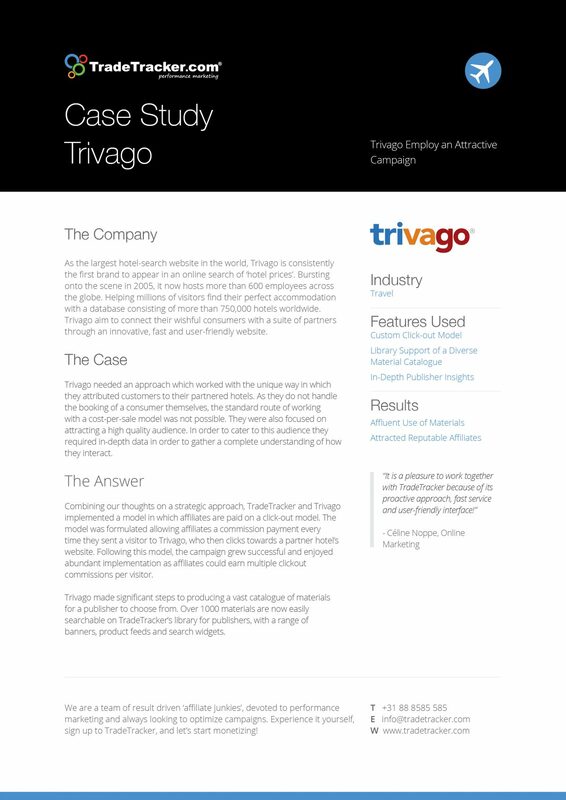 The choice of attribution model also enables advertisers to align their performance campaigns with their online marketing goals. For example, a Position-Based model will push branding, whilst a Time-decay model reflects a greater focus on conversions. An added- value approach is impossible with “Assisted Commission” models, as it picks the selected number of assists regardless of site type, total number of touchpoints, or market segments. Affiliates using promotional banners can be really powerful as the target audiences of your publishers are often similar to yours. By motivating publishers to place your banners by including their impressions as valid touchpoints in the conversion paths, advertisers can benefit from a massive increase in banner impressions. Within an Assisted Commission model, rewarding on impressions is not possible, which makes placing banners financially less attractive to publishers as the chances of these banners being the last click are relatively slim. The combination of rewarding “Impressions as valid touchpoints” with a longer Attribution window (which is not customizable with an “Assisted Commission model”) allows for much greater performance from publishers utilising display. Last but not least, an important difference between Real Attribution and Assisted Commission is the possibility to include other channels. As Real Attribution allows for an unlimited number of touchpoints and offers possibilities which boost the whole performance channel, it is lucrative to include other channels by attaching tracking links to other channels’ links. For example, where retargeting channels have been incorporated into the performance channel, an increase of 20% was seen in transactions tracked for other publishers who would otherwise have been overwritten by the retargeting channel.